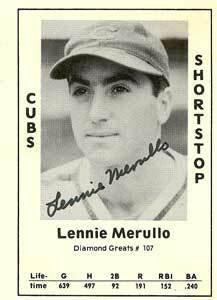 Lennie Merullo, a longtime baseball scout and the last living player from the Chicago Cubs World Series team from 1945, passed away at the age of 98 on May 30, 2015. Career baseball men of his ilk who stormed the back roads of the United States looking for a diamond in the rough without the aid of the Internet and advanced statistics are a vanishing breed. They have been replaced in great number by personnel who no longer have to endure hours of travel across state lines to check out a kid whose exploits are fully available online. Not only are these seasoned scouts being replaced, or in Merullo’s case passing on, so are the volumes of stories they have accumulated through their years of travel across the bush leagues as players and scouts. During his 65-year career, there was nary a star that hadn’t crossed Merullo’s path, and even rarer was the one for whom he didn’t have a special story to tell. One tale he was gracious enough to share was from his second year in professional baseball with the Tulsa Oilers in 1940. This yarn wasn’t about how he played all 162 games that season in the sweltering heat, taking off his shoes and socks in between innings to find relief from the hot fields, or how his teammate Eddie Watikus (The Natural) didn’t sit out a single play the entire season. A few feet farther down the bench resided an unlikely colleague in a 30-year-old pitcher named Dizzy Dean. Dean was in the twilight of his career when he played with Merullo in Tulsa. It was just nine years earlier that Dean was MVP of the same league, en route to one of the briefest Hall of Fame careers in Major League Baseball. After suffering a broken toe during the 1937 All-Star Game, he struggled to regain the form that garnered him 30 victories and a World Series championship with the St. Louis Cardinals. Ol’ Diz was trying to hang on with the Cubs and was a far cry from his former self. Despite not having his best stuff, Dean was still an attraction everywhere he went. His star performance from only a few years earlier in the 1934 World Series endeared him to fans across the Texas League. Not only did they fill up the ballpark to see him play, they came bearing gifts. Dean wasn’t the only beneficiary of the adulation; Merullo also had his day in the sun thanks to his famous teammate. It involved an off-day and a trip to a car dealership that only the great Dizzy Dean could negotiate. The 23-year-old Merullo was mesmerized by what he saw on the lot, pristine top of the line models worth than what the young rookie could dream up at the time. One car stood out amongst the entire stock. Apparently Dean noticed Merullo’s immediate attachment to the car. In a veteran sort of way, Dean gently planted a seed in Merullo’s head. That’s all Dizzy Dean needed to work his magic. “Dizzy walked by and must have saw the look on my face. He just said, ‘I think I can get you a good buy on this, you thinking of buying the car?’ I got out of the car quick. All I could see was dollar signs. It was about $1,000. Just the thought of it, I couldn't afford it.